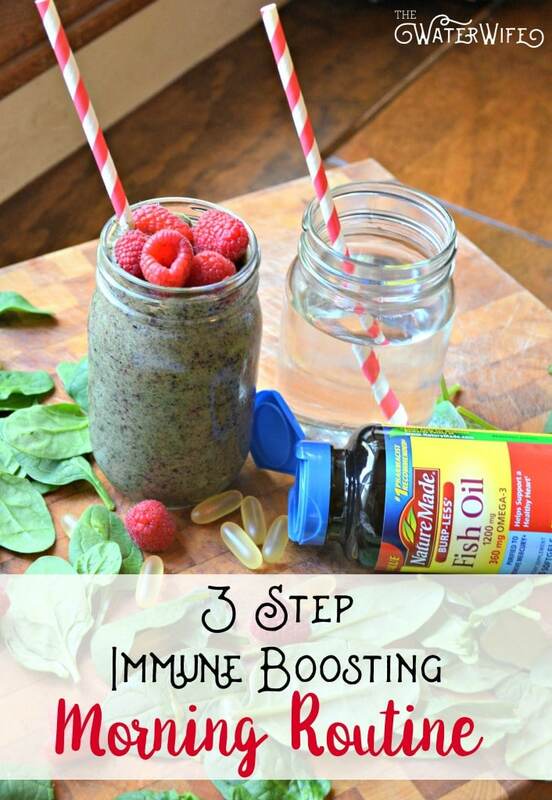 This 3 Step Immune Boosting Morning Routine post was sponsored by Nature Made. I was thinking about January and I thought about what keeps our family healthy and active and how I can keep it up throughout the year and for me it boiled down to 3 things we incorporate into our mornings. So I decided to share our 3 step immune boosting morning routine! It’s simple yet effective for keeping our family feeling our best, so read on sisters! The first one seems simple, I know but you would be surprised how many people do not drink enough water to hydrate their bodies properly. Even if you do drink throughout the day, it is just as important to drink a large glass of water first thing in the morning. My kids only drink water and milk and they still weren’t getting enough. My son was having growing pains so bad they would wake him in the night and our whole family was struggling with sluggish digestion. I implemented a rule that before anyone has anything to eat or drink, we all have a large glass of water right when we wake up to start our body functioning properly for the day. It has made all the difference for our family and how much better we feel. When I lose track of how much water my littles have had, I at least know they have had some that morning. The severe growing pains have stopped, our digestion is back on track and we all have a ton more energy! Who couldn’t use more energy, am I right? Hashtag I can’t drink more coffee! If you don’t love water, add some fresh fruit like oranges, lemons or even cucumbers, start in the morning and sip all day long! 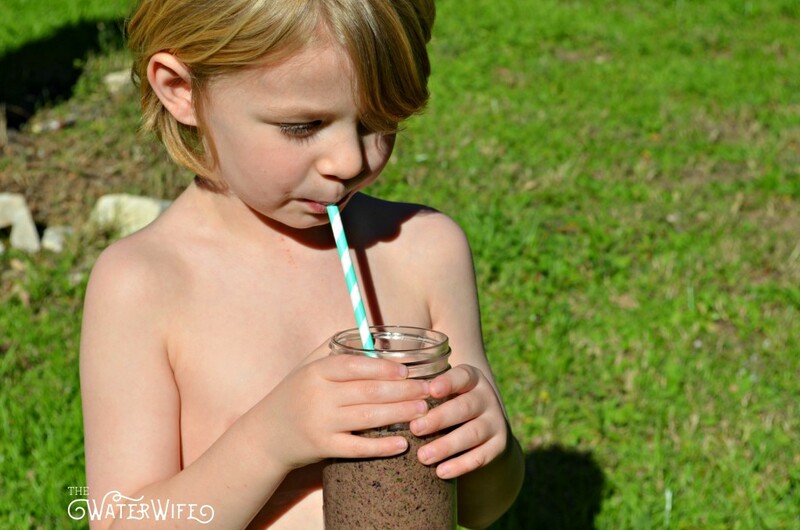 We love smoothies in our house and I love that I can sneak some vegetables into my family first thing in the morning! We have tried a million smoothie combinations and The Water Man swears the two must have ingredients for feeling amazing all day is spinach and blueberries! This is the only way he eats those two super foods, so I am more than happy to oblige! I always start with fresh spinach, bananas and frozen blueberries then I add whatever other frozen fruit I feel like or have on hand. We rotate mangos, strawberries, peaches, pineapple, blackberries and raspberries. 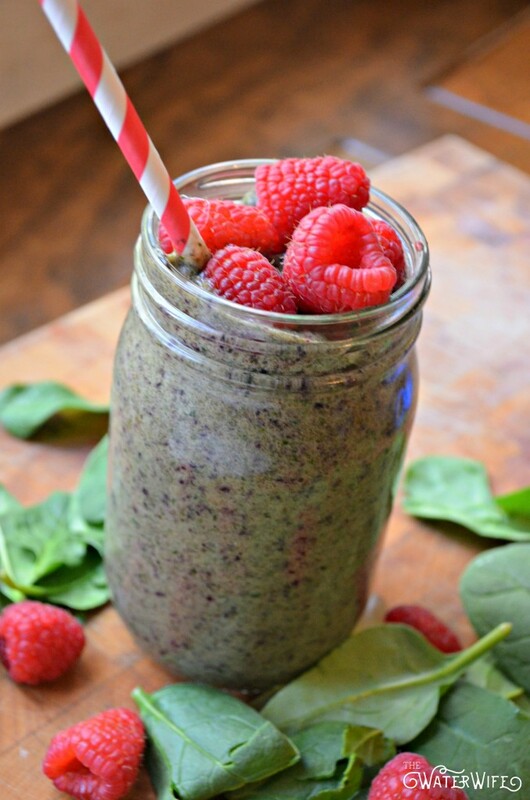 These smoothies are delicious, fresh and packed with nutrients! My kiddos love them! In fact, they drink them fresh and I freeze them in popsicle molds for the healthiest smoothie pop treats! I feel like I’ve won mothering when I give these out as dessert! And to be perfectly honest, many days, this spinach is the only vegetable they get. Thank you picky toddler eaters for your love for frozen sweet treats laced with spinach! I struggled with which Nature Made vitamin I should share with you because to be honest, we love Nature Made supplements and there are several that we take each day. Nature Made is the number one selling vitamin* and I always find the best price and selection of Nature Made products at Walmart. In fact, I was in Walmart with the munchkins shopping when I decided on our very most favorite product. 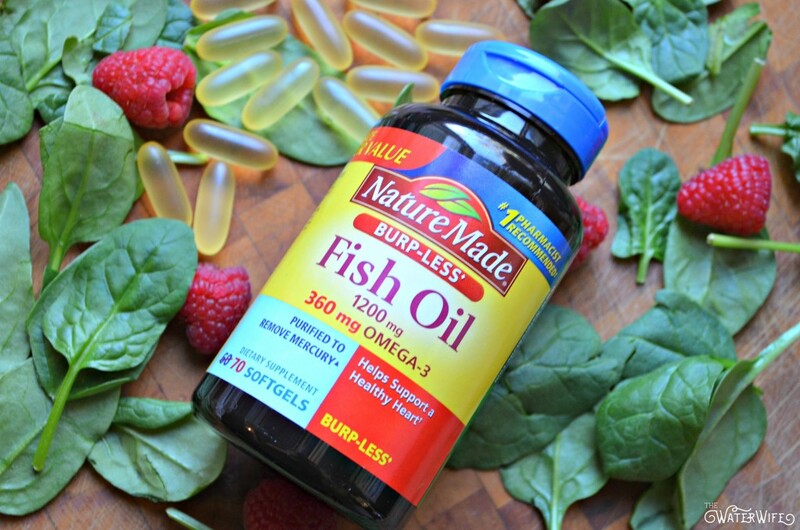 The supplement that has helped The Water Man and I to start the new year off moving and what will help us stay active throughout 2016 has to be Nature Made Fish Oil. We started taking fish oil a few years ago when I was waking up with sore hands and The Water Man was experiencing joint pain. Someone recommended trying fish oil. It made such a difference in how we were feeling, we have both been taking it daily ever since! *Based in part on data reported by Nielsen through its Scantrack Service for the Vitamins Category for 52-week period ending 9/26/2015, for the xAOC, FDM, and FM Markets. Copyright © 2015 Nielsen. **These statements have not been evaluated by the Food and Drug Administration. The product is not intended to diagnose, treat, cure or prevent diseases. This is just my experience y’all. I am very selective on which supplements I give to my family and I trust Nature Made. Nature Made is the #1 pharmacist recommended supplement brand**. I love getting ideas on what supplements we need and how to live a better lifestyle for my health too so I joined the Nature Made Daily Boost Program and I am loving all the daily wellness inspiration. Like I always say, you have to find what works best for your family. These easy changes we’ve made to our mornings have really been a game changer. I encourage you to evaluate your morning habits and make your own changes! Water is a really easy place to start. If you don’t think you have time to make smoothies before school in the morning, try making them ahead of time and serve smoothie pops with breakfast! And get yourself a premium brand vitamin you can trust like Nature Made. You will not believe how much better you and your family will feel! Serve immediately or put into popsicle molds & freeze for 24 hours & enjoy! Love these tips? Find more at The Water Wife!